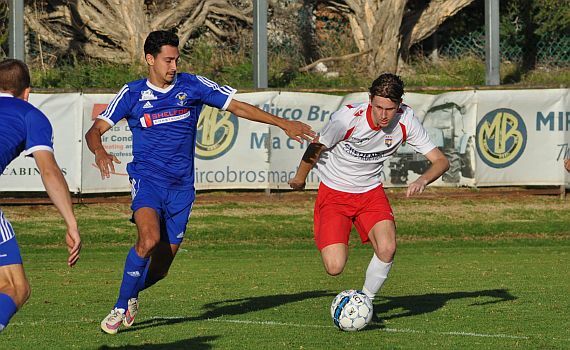 With influential players Gordon Smith and Steven McGarry suspended, an undermanned ECU Joondalup have been well beaten 4-0 by Cockburn City at Dalmatinac Park in week 10 of the PS4NPLWA. The home side who were on the front foot early, and O’Brien shot was saved low by Lewis Italiano on ten minutes, before the ECU custodian stood tall to deny Da Luz moments later. Cockburn were hurting ECU down the flanks, with O’Brien and Da Luz causing havoc, and Italiano had to be alert again this time saving low at his near post to deny O’Brien on the quarter hour. ECU steadied and Bayley Brown-Montgomery’s shot was deflected wide, and Cockburn keeper Luke Radonich produced a good low save to thwart Brown-Montgomery again on the half hour. But Cockburn’s first half dominance was rewarded with the lead on 38 minutes. Tristao raced clear, held off his marker and finished with aplomb past Italiano. Both sides had late chances. Joseph Jones headed just wide for the visitors, before O’Brien burst into the area, but Jones got back with a superbly timed late tackle to deny the former Perth Glory Youth midfielder. The visitors opened the second half well, and Radonich was at full stretch to push over Brown-Montgomery’s cross shot, before Paddy Doyle’s snap shot flashed over the top. It was the best period of the game for the visitors and they went close to the equaliser on 58 minutes. Tommy Amphlett’s cross picked out Bayley-Montgomery at the back post, his header was superbly saved by Radonich. But five minutes later Cockburn doubled their advantage. Da Luz finding space on the right hand side of the penalty area and firing home from a tight angle. The home side then put their foot on the accelerator and it was 3-0 six minutes later. A long ball sent O’Brien racing clear, he outpaced his marker before finishing clinically past Italiano. ECU had a chance to get back in the game on 80 minutes when keeper Radonich brought down Brown-Montgomery and referee Alex Novatsis pointed to the spot. Doyle stepped up to take the resulting penalty, but Radonich went the right way and saved superbly, it summed up the day Dale McCulloch’s side were having. alt was rubbed in the wounds two minutes from time when Cockburn added a fourth. Andres was brought down in the box by Roland Rixer and the Spaniard picked himself up and sent Italiano the wrong way from the penalty to give Cockburn a comprehensive win.